An important text. 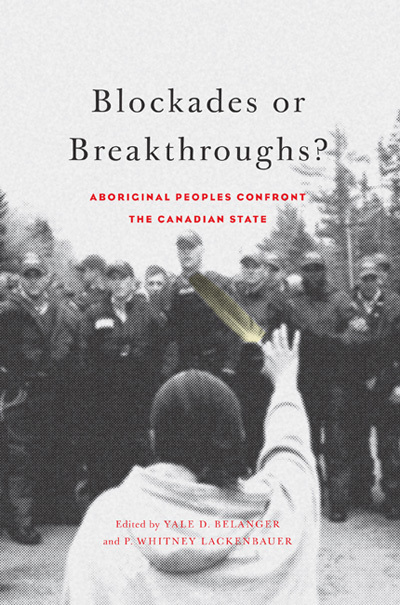 For the first time, comprehensive historical analysis of major First Nations, Métis and Inuit-led direct-action resistance in Canada has been collected in one volume. A highly valuable resource to students and scholars of Indigenous/non-Indigenous relations, as well as those interested in processes of nation-building. Weighted heavily towards historical analysis, the case studies [are] ripe for further analysis by scholars of gender, Indigenous studies, Canadian studies, and sociology. Can blockades and occupations be catalysts for positive change in Canada’s Aboriginal communities? Blockades have become a common response to Canada’s failure to address and resolve the legitimate claims of First Nations. Blockades or Breakthroughs? debates the importance and effectiveness of blockades and occupations as political and diplomatic tools for Aboriginal people. The adoption of direct action tactics like blockades and occupations is predicated on the idea that something drastic is needed for Aboriginal groups to break an unfavourable status quo, overcome structural barriers, and achieve their goals. But are blockades actually “breakthroughs”? What are the objectives of Aboriginal people and communities who adopt this approach? How can the success of these methods be measured? This collection offers an in-depth survey of occupations, blockades, and their legacies, from 1968 to the present. Individual case studies situate specific blockades and conflicts in historical context, examine each group’s reasons for occupation, and analyze the media labels and frames applied to both Aboriginal and state responses. Direct action tactics remain a powerful political tool for First Nations in Canada. The authors of Blockades or Breakthroughs? Argue that blockades and occupations are instrumental, symbolic, and complex events that demand equally multifaceted responses. Yale D. Belanger and P. Whitney Lackenbauer, Blockades or Breakthroughs? Aboriginal Peoples Confront the Canadian State. (Montreal and Kingston: McGill-Queen’s University Press, January 2015).